McCormick & Co. has teamed up with IBM to use artificial intelligence in its flavor and food development, the firm announced Monday. The company will take hundreds of millions of data points developed from its more than 40 years of food science work and use machine learning to develop more flavor profiles. 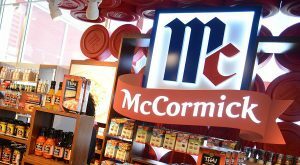 McCormick expects to launch its first product platform using artificial intelligence by late spring this year. The ONE platform will include one-dish recipe flavors including Tuscan Chicken, Bourbon Pork Tenderloin and New Orleans Sausage. ONE will include spice mixes that can season protein and vegetables. McCormick said artificial intelligence has helped the company access an expanded portfolio of flavor profiles, enhanced their creativity and sped up how long it takes the company to develop flavor formulas. McCormick has plans to scale its use of the technology globally by 2021. Tagged with: artificial intelligence McCormick & Co.